It’s not the be-all, end-all of universal remote controls, but it’s plenty powerful for most people’s needs—and Alexa is onboard to lend a helping hand. Logitech’s Harmony division makes better universal remote controls than just about anybody. Its latest model, the $250 Harmony Express, might be its most practical, even if it’s not the company’s most powerful. The Harmony Express doesn’t have all the bells and whistles of the company’s top-of-the-line Harmony Elite ($350 MSRP), which Logitech will continue to sell. The Express doesn’t have a touch-sensitive display, it doesn’t have as many programmable buttons, and it can’t execute complex macros that incorporate both home entertainment gear and smart home devices. But don’t mistake its apparent simplicity for a lack of horsepower. The Express can do much of what the Elite can for a lot less money, and—since it has Amazon’s Alexa onboard—it can do some things the Elite can’t. The genius of Harmony’s approach has always been its extensive library of remote control codes that are stored in the cloud. You tell the Harmony Express mobile app—available for Android and iOS—about the equipment you want to control, and it downloads the codes to the remote. This process is even easier with the Express, as it can detect much of what’s in your entertainment center on its own. You drag your entertainment system components to the HDMI inputs they’re connected to. 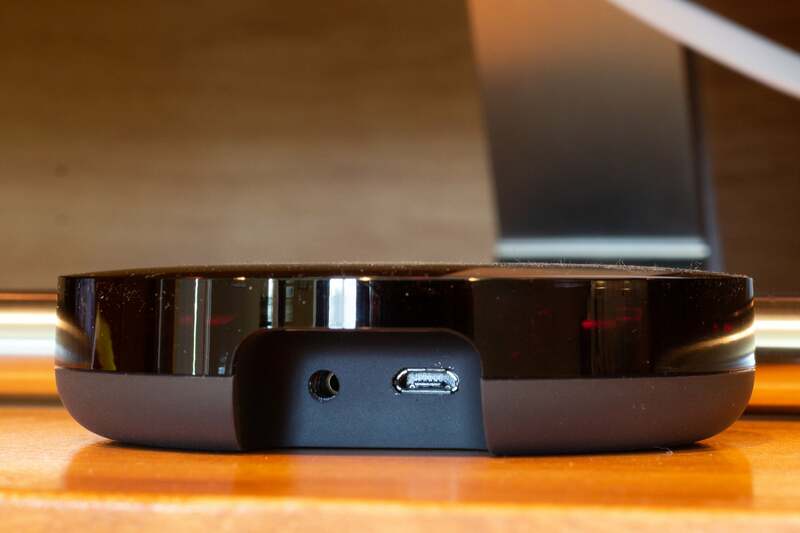 It sniffed out my Samsung Q7F QLED smart TV, my DirecTV set-top box, and my Xbox One video-game console, all of which are connected to my home network. But it wasn’t perfect. I had to inform the app that I also had a Cambridge Audio CXUHD 4K Blu-ray player in my equipment rack, even though that also has an IP address. The Harmony Express is designed to control a single entertainment system—focused around your TV—in one room. 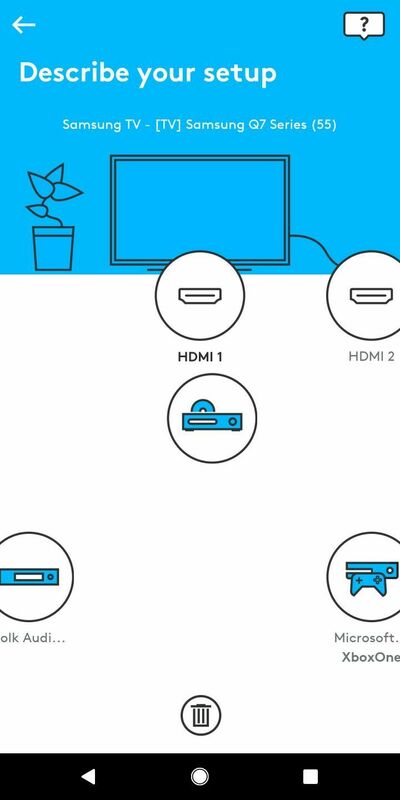 The remote knows what inputs your TV has—four HDMI ports in my case—and diagrams them in the app. The rest of the equipment in your entertainment center appears beneath those ports and you simply drag their icons to the relevant HDMI ports. The hardware element of the Harmony Express consists of three components: The remote control, a large infrared blaster that you sit in front of your entertainment center, and an IR mini blaster that enables you to control audio and video components that you might have hidden inside a cabinet. The 5.25-inch-long by 1.75-inch-wide remote has just three rows of three buttons arranged beneath a directional pad encircling a round OK button. The functions of the nine buttons can change depending on which device the remote is actively controlling, but most of them will be universal: Rewind, fast-forward, play/pause, volume up, volume down, and mute. The directional pad lets you navigate onscreen menus (up, down left, and right) and pressing the center button selects the highlighted function. Pressing and holding that center button, on the other hand, summons Alexa so you can use voice commands to power on all the devices needed to watch TV, launch a smart TV app (either on your TV or on a streaming box), to control anything else you have Alexa set up to do. You don’t need to say “Alexa,” either—just holding that center button down for a second or two is enough. Alexa’s voice responds via a small speaker built into the remote. 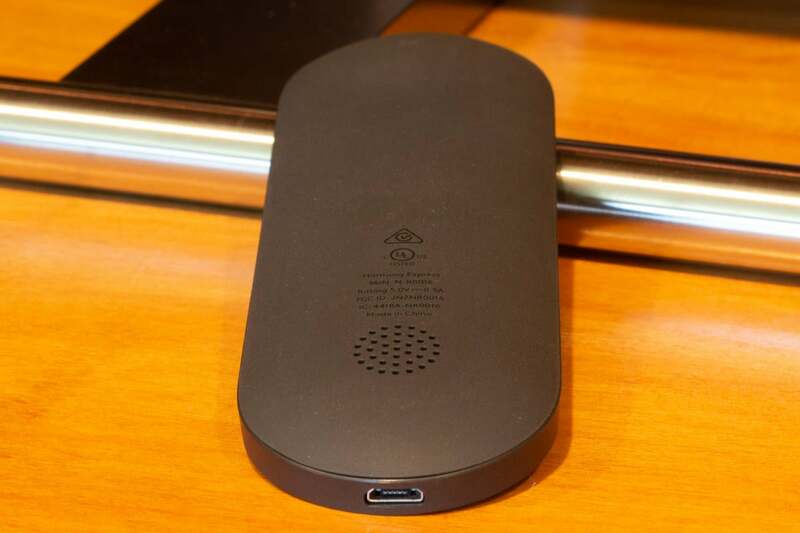 The Harmony Express remote control has a small speaker on its back, so that Alexa can confirm your voice commands. In my set-up, holding the button down and saying “Turn on TV” was all I needed to do to power up TV and set-top box and switch the active display to the set-top box. To change the channel, I just held the button down and said “Go to channel 200” or whatever channel I wanted to watch (the system also recognizes channel names, such as NBC or HBO). If I wanted to play a TV program I’d recorded, I could say “Go to DVR” to bring a list of recordings. I then used the D-pad to move up and down the list until I found what I wanted to watch and pressed the OK button to play it. The Harmony Express remote has all the basic buttons you would expect to find. Using the Harmony Express app felt very much like using the DirecTV’s native remote—to a point. If I wanted to delete a recording using the DirecTV remote, I could just press the red button and it would be gone. Deleting every episode of a series can be done just as easily. 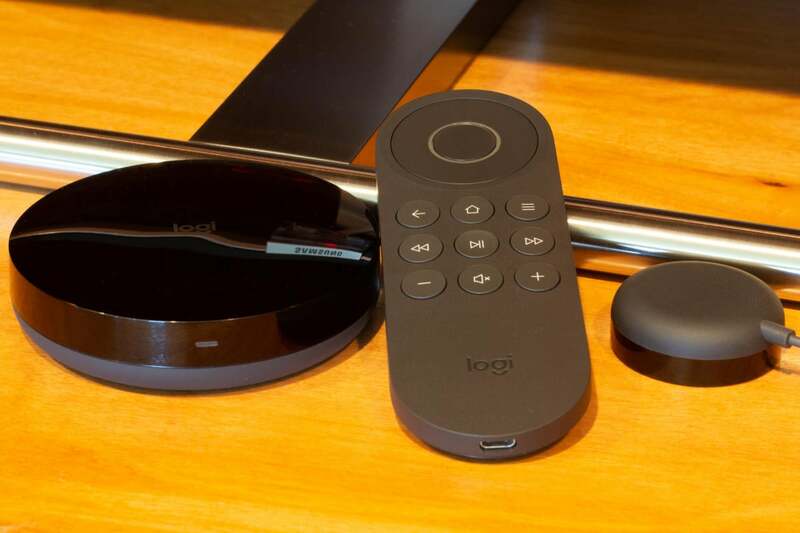 Deleting DVR programs with the Express involves more steps, although Logitech says its working to make it easier to use voice commands to perform actions for which no physical button exists on the remote. It’s just as easy to launch a smart TV app—Netflix, Hulu, or Amazon Prime, et al—with a voice command, although the phrasing is slightly different. Instead of holding down the button and saying “Turn on…” you say “Go to Netflix app” or “Go to Hulu app.” In the few days I’ve had access to the Harmony Express, I’ve struggled to remember when to say “Turn on” and when to say “Go to.” I imagine I’ll become accustomed to the difference with experience. Once you have the Harmony Express configured to your entertainment center, you can also control all your gear with any member of the Echo family. But you’ll encounter so many other situations where the remote control is faster and/or more precise than barking orders at your TV. And the only things you can’t ask Alexa to do via the Harmony Express is to play music and make phone calls using the remote’s speaker. You can plug as extension IR blaster into the Harmony Express’s primary IR blaster. The Harmony Express strikes a good balance between power and complexity. It’s very easy to set up, and it makes the most of Alexa’s ability to control hardware using voice commands. The remote itself won’t overwhelm you with buttons and inscrutable icons, but its simplicity does limit what you can do with it. If you want a remote that lets you stitch together complex macros that can cascade through your smart home, dimming the lights, closing your shades, and dropping the video projector screen from the ceiling at the touch of a button, you’ll want the more powerful Harmony Elite. If your needs are simpler than that, and you just want to get rid of all the extra remotes cluttering your coffee table, the Harmony Express is worth a look. It’s not as powerful as the Harmony Elite, but it’s not as complex or as expensive as that universal remote, either.